It took them a long time. I was stupid not to realize the obvious fact. Here we are, finally, united in a new world order of happiness and a future so bright that I have to wear shades. For most people much like myself, we always thought it was the United States and the armed citizenry that stalled and prevented the establishment of this new order, both economic and political. Sadly us Americentric types focused on our nation as the center of the universe failed to see the big picture and I did not realize until tonight that it was not Presidents Bush and Obama that prevented the new order from taking hold. It was not the Tea Party, Republican Party or the Libertarian Party which obstructed the globalist regime. It was not Joe Redneck, Joe Six-Pack or Joe the Plumber that intimidated or slowed down the establishment of this order. It was our friends in Europe. And last [Sunday] night a shotgun wedding was performed. Miss America, meet your groom, the European Union. The idea that the European Union needed $1 trillion to bail out Greece, Italy, Ireland, Portugal, and Spain is absurd. Even if all of that money was obtainable on the open markets or via fiat creation it does nothing to repair or restore the economic engine of hybrid Corporatist Statism, but does indicate the level of desperation that the powers in the West are willing to resort to in a last ditch effort to insure the expansion of and maintenance of their fortunes and power. Here we are, at the crux of another crisis and a “miracle” cure is found by creating more debt to service, not pay off, existing debt from various member nations who were resistant to the idea of a unified political structure. Ireland and the other PIIGS nations wanted no part of a unified Parliamentary structure for the EU with the ability to dictate law and settle on a series of Constitutionally mandated rights for the member nations. Yet here we are with those very nations who opposed such a regime surrendering their economic freedoms and in turn insuring such an animal will exist, a beast to America’s east. Despite years of people calling others ‘tinfoil freaks’ of whom I have been guilty of that years and years ago, the conspiracy is not that nor has it been for two years now. 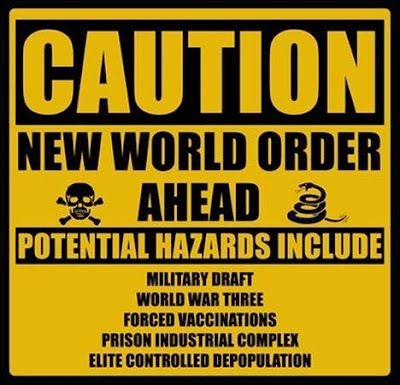 The conspiracy has turned into a course of action where people are being deceived into believing that according to the leaders of the West, aka the United States and Europe, that there is no other choice if we wish to survive as a civilization. Common sense tells the informed citizen otherwise but the panic and hysteria created on an almost scheduled, regular basis, be it an oil spill in the Gulf of Mexico, financial crisis, war, or terrorist act keeps many citizens from understanding or realizing the activities being undertaken behind the scenes. How many people realize that the new financial reform package expands the powers of the Federal Reserve to the point of extra-Constitutional authorities not implied nor given to the Executive Branch as written within that damned piece of paper? How many people who run a small business now understand that starting in 2012 you have to give a 1099 to every vendor you purchase $600 or more from? How many citizens understand that Homeland Security is working with the Congress to create a standardized National Identification program under the guise of the Health Care legislation to provide the ability to monitor not just the consumption patterns of citizens but the transportation habits, domestic and international, of our citizens to enable further taxation due to the risks created by those who can afford to travel to and fro? If so, are you moving towards self-sufficeincy in all things, to the utmost extent possible? The People of the United states did establish their Supreme Court to secure the blessings of Liberty. Supreme Court justices committing perjury against The Constitution also commit Article III Treason against the United States. Reason: The justices use public force to levy war. Don't cry about the Federal Reserve Bank. Prosecute the justices for combining with felons to embezzle(and levy war against) the money of the People of the United States. Yes, brother, things look dark. ! May I offer yet another way of 'questioning the premise' built into this commentary ? May I suggest a novel plan ? Just stop obeying. Don't pull out a gun, just don't file paperwork with ANY bureaucrat. They say the system is based upon 'voluntary compliance' - ok, so that requires TWO parties, THEM to 'require compliance' and YOU or I to voluntarily comply. "when the tyrants come, I'll give em tooth & fang, my AK-47, bullets first"
yet every mid-April they run madly around filing everything they can, living out total fear of the pencil necked pencil pushers. Surely this is 'Walter Mitty' thinking. Practice bravery in small steps, then larger ones. Surely peaceful non-compliance, in pursuit of reclaiming our personal sovereignty, preceeds ANY thought of armed conflict. Do you have a plan to 'reclaim our personal sovereignty' ? As a Christian, I misunderstood that term for a season. What 'personal sovereignty' meant to the Founding Fathers, (and should mean to us, today, if we are to inherit their legacy of Liberty) is: self-government, under God, according to the dictates of individual conscience. www.SEDM.org, 'Sovereignty Education & Defense Ministry'. Make sure to read the PDF file, "How Scoundrels Corrupted Our Republican Form of Government", which has many links to foundational documents & get the truth to our neighbors. I say this, because only proper knowledge & faith in a cause greater than ourselves, can breed confidence. The TRUTH is in the side of the Christian Patriot - it has ever been thus. In Patrick Henry's famous speech, he called this struggle "the Holy cause of Liberty". So it was then & so it is now. Think of the Colonial days, the Brits ruled every continent, we were their child, most referred to them as, Mother England. Yet she became an abusive mother, unworthy of the term (sadly), and to save the abused child (young Colonies) life, a permanant cleveage was required, at the cost of much blood. We should not assume that war here to the hilt is necessary (or at all to be desired), IF we use peaceful, LAWFUL means of asserting our God granted, UNalienable Rights to our Life, Liberty & Property. We can & must defend our lives & property against all aggression, but our first defensive means is by 'un-volunteering', peacefully, firmly. Any who aren't willing to undertake these challenges, don't love Liberty enough to prevail, in the end. Stop obeying tyrants. Get a job paid in cash or barter. Stop going along with bureaucrats. They don't have a large enough jail, or enough enforcement to cart us all away, if just 10 % of Americans stand up as Patriots. I'm not saying "Put the gun down, for good" (just away for now, but have it cleaned, prepped & ready & be a Rifleman), don't pick it up UNTIL you've personally resigned from 'voluntary compliance'. Oh and another thing, switch off the tube - for good. It's the TV & media scare programming that has Americans fearful & cowering. We switched it off 15 years ago - our time is much better invested reading redeeming stories of heros & martyrs of prior ages - William Wallace or the Founding Fathers - that foster genuine character !